In the first case of k = 0: n=2 is trivially impossible. The next case k = 1: n=6 is, according to Euler’s conjecture, impossible and so also cases where n= 10, 14,18, 22,26 …. etc are impossible. This conjecture went unsolved for over 100 years. In1900, a French mathematician, Gaston Terry checked every possible combination for a 6 x 6 Euler square and showed that none existed, partly proving Euler’s conjecture. 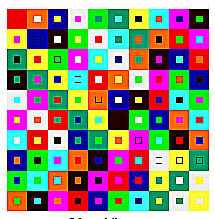 The Euler Square which is shown on the left where n = 10, which for 177 years had been believed to be impossible was finally constructed by Parker in 1960.Here in each column and in each row each color of the outer square and each colour of the inner square occurs only once. No combination of 2 colours occurs twice.